Poached eggs are delicious and healthy – and if you know these few simple tricks for how to poach an egg, they’re so easy to make! 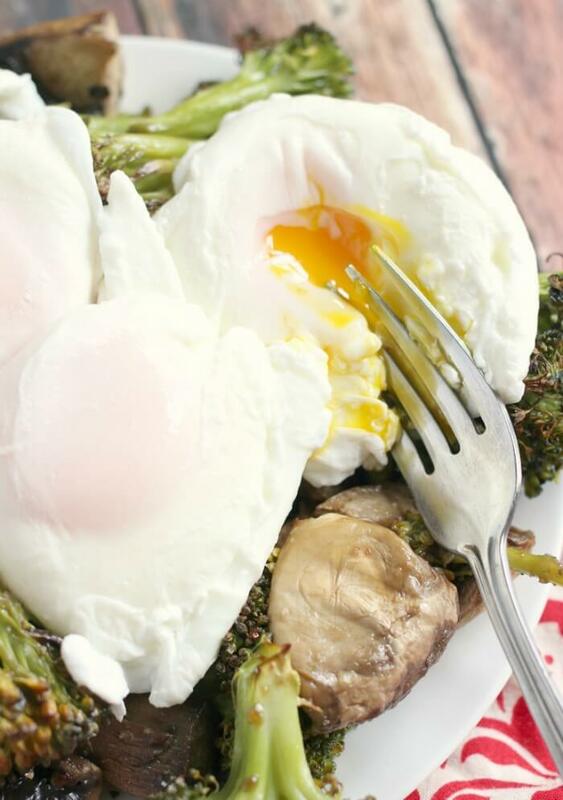 When I first learned how to make poached eggs, I was so excited because they’re one of my favorite breakfast foods! I love a poached egg on toast with hollandaise sauce and a side of oven baked bacon. 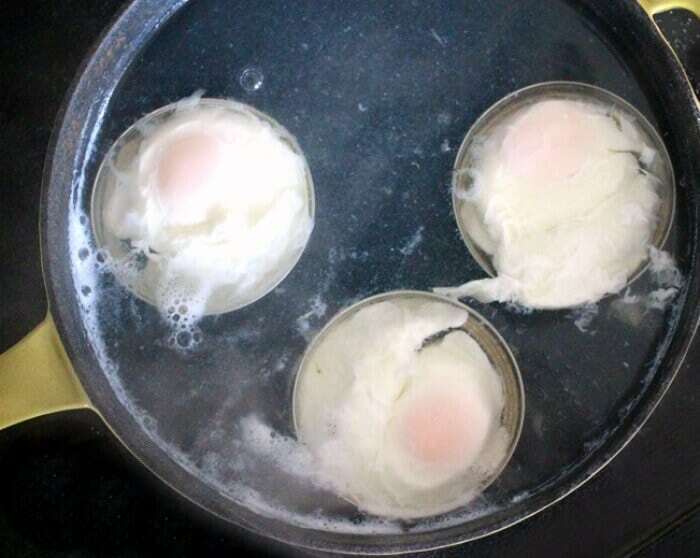 The key to perfect poached eggs is vinegar and mason lid rings. I know, sounds like a weird poached egg recipe, but it will change your life! Well, at least your breakfast making life. Are poached eggs good for you? Poached eggs are great because they’re just pure egg – no oil or unhealthy fats added in the cooking process. Poached eggs are about 70 calories, and a poached egg can supply as much as 6 grams of high-quality protein. 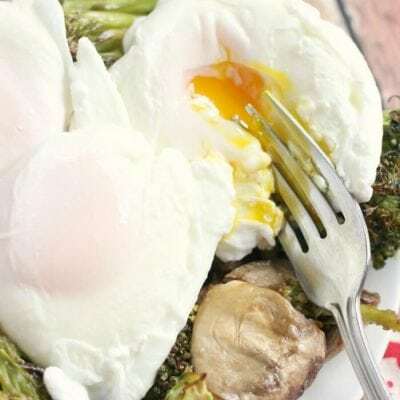 One poached egg also has between 4 and 5 grams of mostly unsaturated fat as well as vitamin D, antioxidant compounds, and choline, which is essential to healthy brain function. How long to poach an egg? The cook time on a poached egg is about seven minutes for a firm egg white with runny center. If you want a firm yolk, you’ll want to increase the cook time 2 – 3 minutes. This cooking estimate does not include the time it takes to bring the water to a light boil. Depending on your elevation, this will add about an additional ten minutes. What are poached eggs like? Poached eggs are traditionally have a firm white and runny yolk. Poached eggs are similar to fried eggs in that poached eggs – the difference being they’re cooked in water so there is no added fats or oils, and the white is firm but there are no hard or crunchy edges like you get with a fried egg. Poached eggs are perfect on salads or sandwiches. If you prefer an egg with soft white but also fully cooked yolk, you’re probably better off with hard boiled eggs. 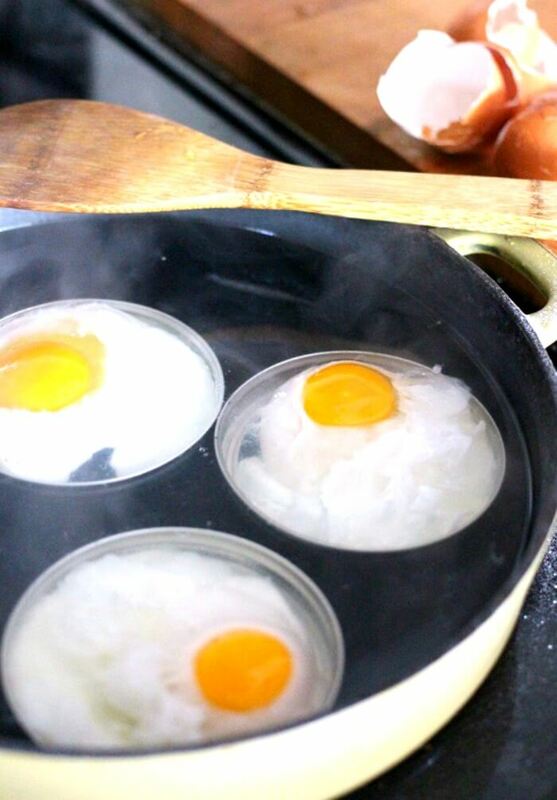 The best way to poach an egg is to bring a sauce pan with filtered water, vinegar, and salt to a low rolling boil. The vinegar helps keep the egg white together. If you try to make a poached egg without vinegar in the water, you run the risk of losing a lot of the white and having your water look like egg drop soup. 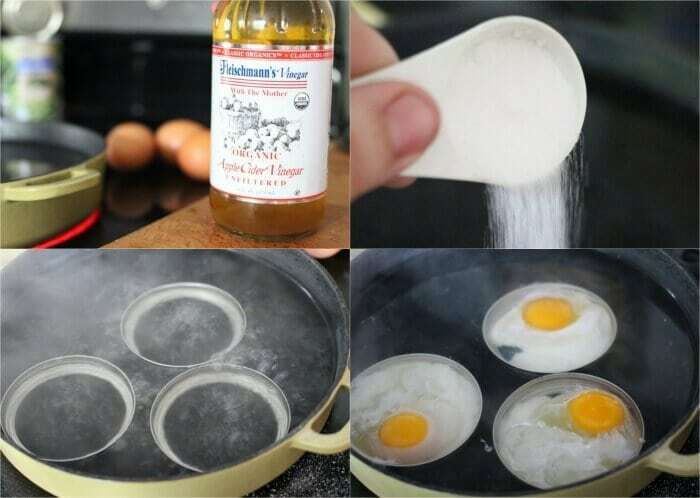 Add as many mason jar lid rings to the pan as eggs you plan to make. Gently crack the eggs into the rings. 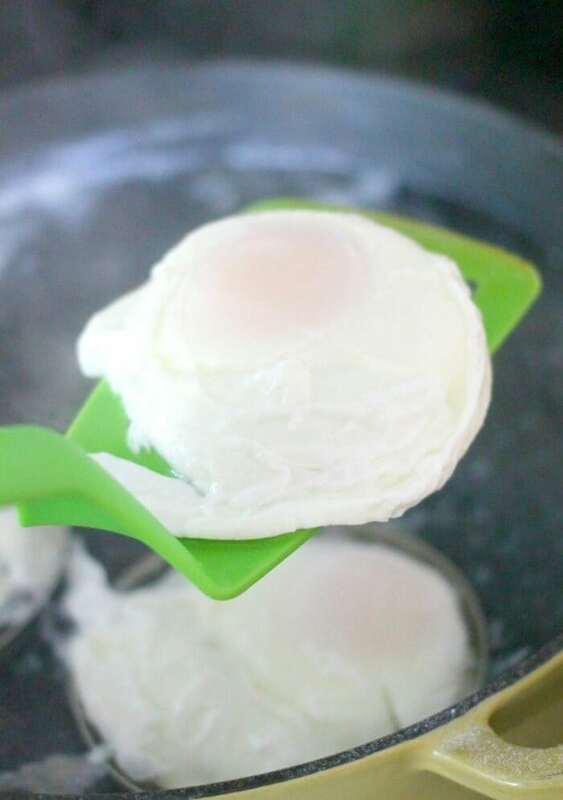 When the poached eggs are done to your liking, gently remove the rings and then use a spatula to take the eggs out of the pan. Eggs – Any size or color egg works just fine (seriously, egg color just has to do with the type of bird that laid it, not how healthy it is for you). That said, if you can spring for pasture raised eggs, those are the most nutritionally dense. And don’t be fooled by packages bragging about “vegetarian fed chickens” – chickens in nature aren’t vegetarians! Water – Filtered water works best. You want to make sure you’re tasting the poached eggs, not the chlorinated water. Vinegar – I like to use apple cider vinegar because it’s what we generally have on hand, but any type of vinegar will do the trick. If you find the eggs are still running too much, add a little more. It will be dependent on how big your pan is and how many poached eggs you are making. Salt – Use a good kosher salt, not table salt. Did you know table salt isn’t just salt? Mmmmhmmmm. High walled pan – This one from Le Creuset is my personal favorite. And I love that it comes with a lid which makes bringing things to a boil faster. It’s also oven safe. Wide Mouth Mason Jar Rings – These are the perfect size for a single poached egg. There’s no reason to buy expensive egg poachers when you can get these for a couple bucks! Spatula – This spatula is epic. Also, it’s red so that makes me happy. Greek Yogurt Pancakes – So fluffy! Cream Cheese Pastry Braid – It’s practically dessert for breakfast. Breakfast Chili – And this one’s nearly dinner for breakfast. Ham and Potato Breakfast Bake – We actually do eat this breakfast casserole for dinner sometimes! Peanut Butter Chocolate Granola – Perfect for on the go breakfasts. You can also watch us make these poached eggs on YouTube as part of our Eggs Benedict Florentine on hash browns! Make sure to tune in for all our live cooking shows! Poached eggs are delicious and healthy - and if you know these few simple tricks for how to poach an egg, they're so easy to make! 1 - 2 tablespoons vinegar I used apple cider vinegar, but any type will work! Fill a deep sauce pan with water, add salt, and vinegar. Bring to a rolling boil and drop in mason jar rings. Cook about 7 minutes, or until you reach desired doneness. Lift eggs/rings out of water with a large spatula and take mason ring off spatula before plating eggs. Enjoy as is or with our delicious hollandaise sauce! Here is our ridiculously easy Hollandaise Sauce Recipe made with a blender! These are the mason jar rings we use. 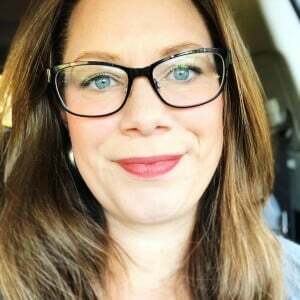 I am new to the blog. Love, love this tip! Could you please post the recipe for hollandaise make with a stick blender. Thanks! Judy M.
Love all these tips for making poached eggs. My family loves them cooked this way! I knew about using vinegar but the mason jar lid idea is new ….. brilliant!!! This will definitely help up my game for poached eggs!! Thanks for all the great tips! I love poached eggs! There’s nothing like a good poached egg to make a meal delicious! Poached eggs are one of my favorites, such a great breakfast. I’ve made them a million times and never tried the vinegar addition. Doing that tomorrow morning! I’ve always wanted to learn how to do this. Thanks! Yum, can’t wait to make these for Steve for breakfast.. I’ve never tried poaching eggs before! A poached egg on a toasted slice of homemade bread…I’ve died and gone to heaven! 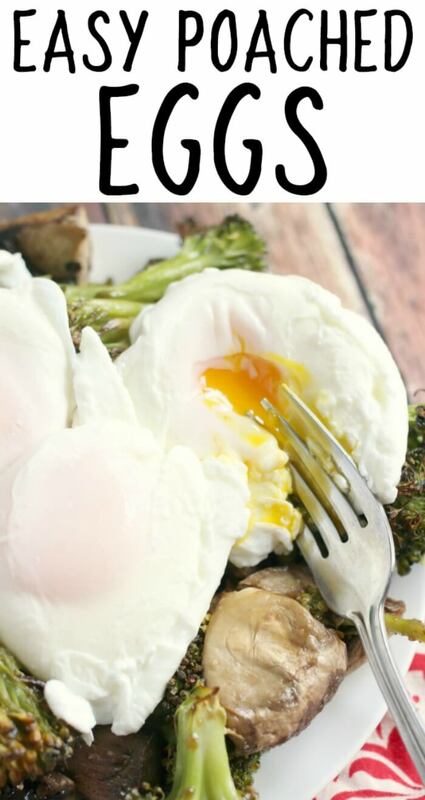 This is a fabulous tutorial/recipe for perfect poached eggs! Thank you SO MUCH for walking us through this!